It is a recognized fact that, had the war gone badly for the Allies on the India/Burma front, and had the Japanese succeeded in invading the Indian Continent, the outcome of the war would have been entirely different. Yet despite this, the campaign on the Burma front is offered surprisingly scant coverage in the majority of photo-history books. This new book, from respected military historian and author Norman Franks, attempts to redress the balance, noting the importance of this particular aerial conflict within the wider context of the Second World War. Franks takes as his focus the pilots, aircraft and landscapes that characterized the campaign. Photographs acquired during the course of an intensive research period are consolidated into a volume that is sure to make for a popular addition to the established Images of War series. Many unpublished photographs feature, each one offering a new insight into the conflict as it unfolded over Burmese skies. The archive offers a wealth of dynamic images of RAF Hurricanes and Spitfires in flight, with shots of both the aircraft and the pilots employed during this challenging conflict. To fly and fight in Burma, pilots really had to be at the top of their game. The Japanese enemy certainly weren't the only problem to contend with; weather, poor food, incredible heat and all its attendant maladies, jungle diseases, tigers, elephants, fevers... The Japanese were the real enemy but the British pilots had so much more to deal with. And they did it for years. In Britain, a pilot could look forward to a break from operations every six months or so on average. 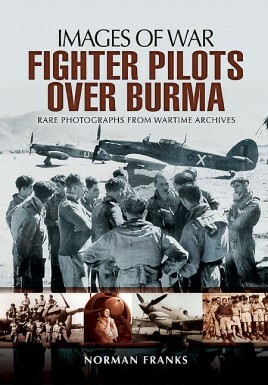 In Burma, pilots first employed in 1941 were still flying operations in 1944. The collection represents a determination on the author's part to record the part played by these resilient and skilled RAF fighter pilots, the contribution that they paid in supporting General Slim's 14th Army and the part they ultimately played in defeating the Japanese attempts to break through into India. These efforts, all paramount and imperative to success, are celebrated here in words and images in a volume sure to appeal to Spitfire and Hurricane enthusiasts, as well as the more general reader.